Ha! You think you’re so clever! You thought, “I’ll just skim down to the summary paragraph and see who it is! I’m so smart!” Well, that sure as Hell isn’t the case, buck-o! You’ve got to actually click the story to find out who the winner is! So, if you don’t know, we at Comic Impact have been having our Cosplay Girl Of The Year contest as voted by you, the reader/sycophantic follower. The contestants were all 11 of our Cosplay Girls of The Month from 2010. Every month we at Comic Impact feature a different Cosplay Girl who really shines in their ability to create authentic comic book inspired costumes. It has been quite a competition. We received over 6,000 votes by the time the poll ended. There really was no easy decision, every girl in 2010 was really outstanding with their costumes and deserved the top spot. Luckily for us at Comic Impact, the decision wasn’t up to us. Pressure = off! Congratulations, Kit. She’ll be receiving a $100 Amazon gift card, her caricature drawn by Justin Orr which will be featured on our new Comic Impact t-shirts and flyers, and she’ll get her very own monthly Cosplay column on the site. We at Comic Impact want to thank all of the girls for their involvement in Cosplay Girl of The Year and Cosplay Girl of The Month. Everyone involved in the contest brought their “A” game and you’ve all helped to make our site so much cooler. 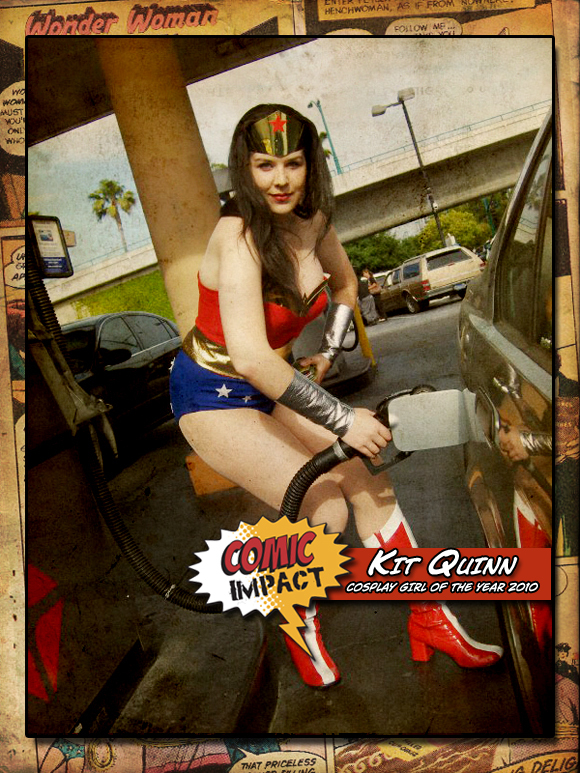 Thank you very much for your participation and congratulations again to Kit Quinn, Comic Impact’s Cosplay Girl of The Year for 2010!